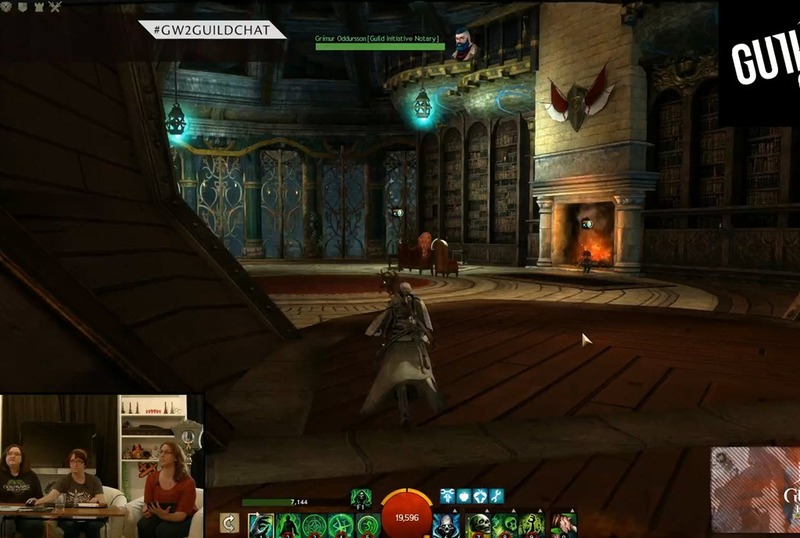 GW2 Guild Week Day 1 livestream notes where some of the upcoming guild features in Heart of Thorns will be discussed. Need to have a guild to enter. 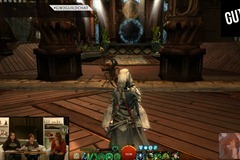 It is located in the Postern Ward area of Lion’s Arch. It is the place guilds can go to at first before they have a guild hall. Many of the upgrades for guild halls can be obtained here from the NPCs. Guild Armorsmith, Guild Weaponsmiths, Guild Anvils Guild Commendation vendors etc are all inside. 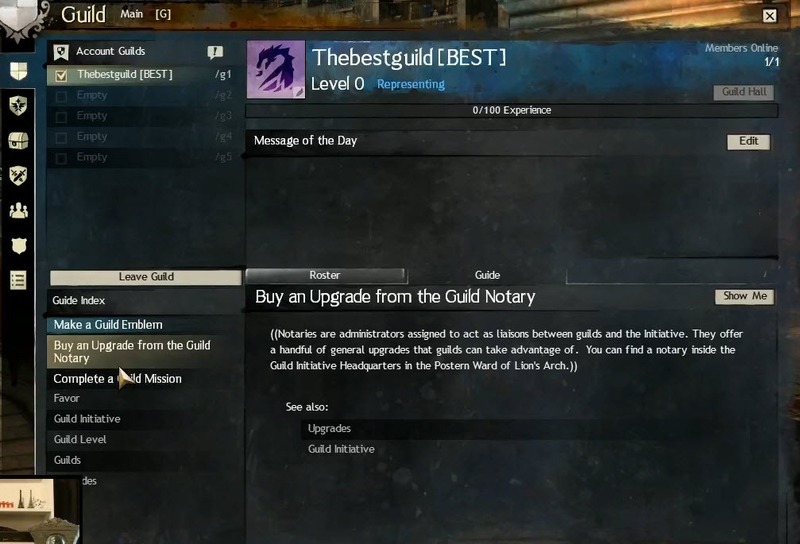 You can talk to the Guild Initiative Notary NPC to purchase upgrades for the Guild Initiative Headquarters. Your guild members can gather here for guilds that do not have a guild hall. NPCs here are able to unlock expeditions for you to claim guild halls. After you talk to the NPC to start the expedition (need to hand over 100 gold), you have to make your way to the jungle and find the entrance to the guild hall which isn’t easy to find. You need to defeat the Mordrems inside, which requires coordination from anywhere from 5-200ish players (will be scaled based on how many people are there). if you fail the expedition (i.e. fail the time limit), you can restart it without having to pay 100 gold each time. After the Mordrems are defeated, you will start off with Tavern to upgrade, then build the Mine which will generate materials for other upgrades. Following the Mine, you build on workshop (which unlocks scribing and opens up other upgrades). 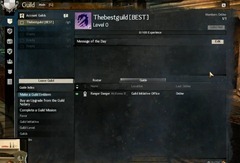 Account guilds are listed as g1, g2, g3 g4 etc. They are your individual guild chat channels where you can talk to all your guilds without representing the guild. 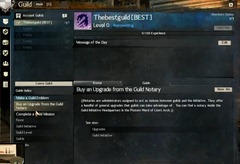 Representing the guild only require you to tick the checkmark next to the guild you like to represent. Guild Index – Basically a list of guides that take you step by step through all the guild features and guild halls. 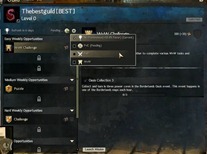 Guild emblem will no longer require upgrades – you can use that feature right away after creating a guild. Some new emblem will be added to the game with HoT as well. 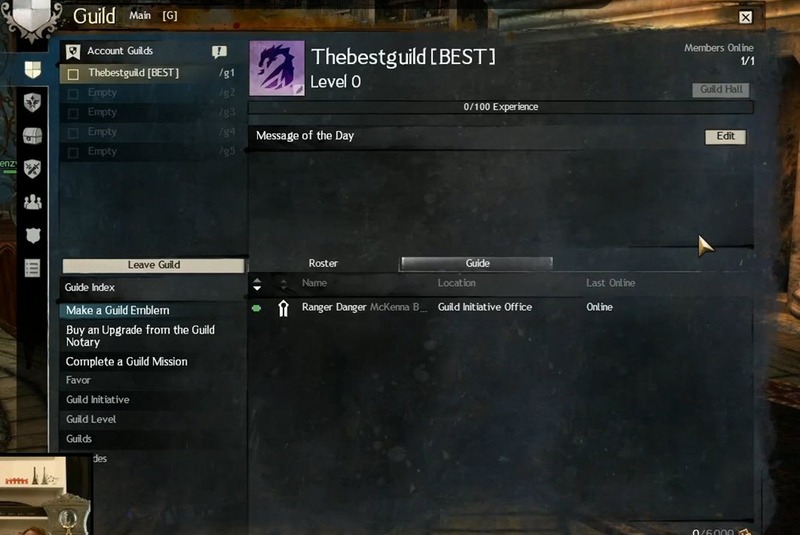 Message of the Day window will be moved to the side and a new attribute window will be there to inform you of things such as what permanent buffs your guild has unlocked and what guild music/anthem is selected etc. Missions are reworked so it is not hidden behind a bunch of upgrades and it is easier for smaller guild to complete. Guild missions are now on weekly slots with easy, medium and hard slots. You can unlock additional missions within each slot by upgrading your guild rank/guild hall. 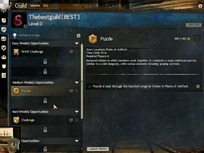 However, there are also WvW, PvP and PvE opportunities below the weekly slots that require a different way to unlock. WvW opportunities will require you to purchase Mission Slot: WvW unlock from the war room. 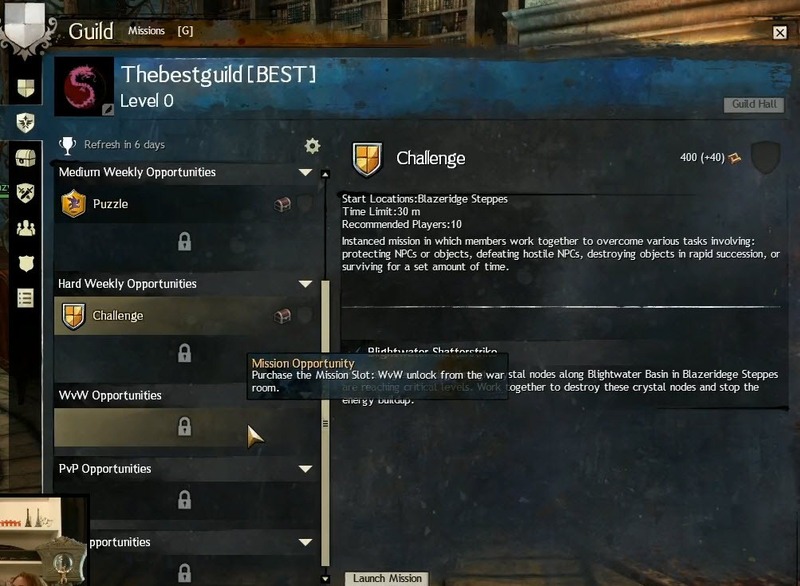 Guild Mission slots are on a weekly rollover, but you can select a preference to do only PvE, PvP or WvW guild missions so the selections for easy/medium/hard weekly opportunities reflect that. If you have no preference you get a mix and get a 10% favor bonus. The non-weekly WvW/PvP/PvE opportunities do not change based on your preference and will always be available. Easy missions are geared towards small guilds but big guilds can still do them. Medium/Hard range in difficulty and number of people. Easy give 300 favor, medium give 400, and hard give 500. There is a favor cap each week and an overall favor cap. There are now crest and chest icons next to each of the easy/medium/hard weeklies to keep track of rewards. Crest means your guild has completed the guild mission and received the rewards while the chest icons are for individual players. Guild missions now have a button to abandon the mission, there is a cooldown of a few minutes before you can restart it. There is to prevent guilds from cherry picking the Bounty/Trek missions. Guild Challenges/Puzzles are now instanced. 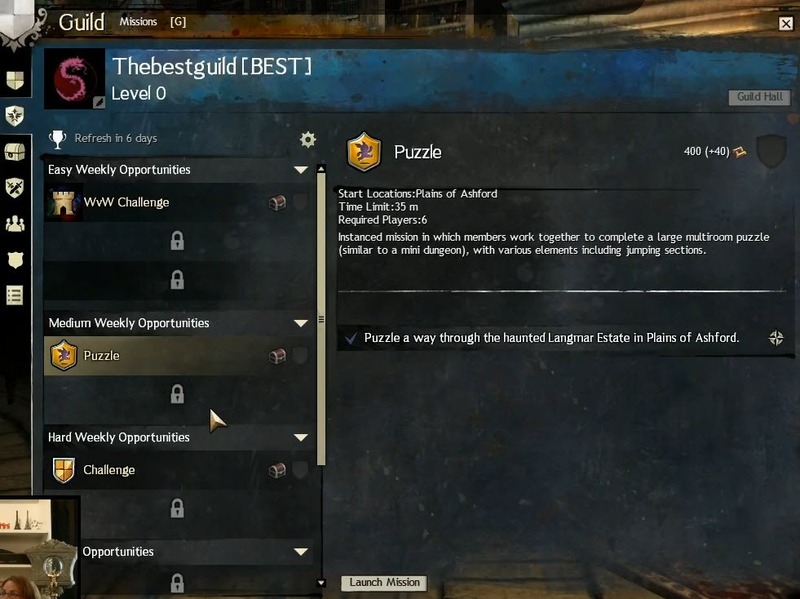 Every guild will have the same challenge/puzzles for the same week. Need to be on a guild team (3-5 players). Some missions (i.e. hard ones) may require you to have more than one guild team. PvP Win (win a different game modes or a specific game mode). You cannot do them in custom arenas. They are only available in unranked arenas. You need to start the guild mission before you go to the arenas. You cannot do any of them in Edge of the Mists, it is only in Borderlands and Eternal Battlegrounds. I totally failed on properly discussing the MoTD today. So I have some information I think you’ll enjoy (or hope you and others enjoy) concerning it. Whenever you log into game you will see the MotD broadcast to your chat for that guild you are representing at the time of log in. Whenever you represent a guild you will see that guild’s MotD broadcast into your chat. Whenever someone in your guild edits the MotD (they will need guild permissions to do this), you will see your guild’s MotD broadcast to the chat. Also, to touch on the concerns about the size of the field for the MotD: The “Attributes” section I spoke of at end of stream will only be as wide as the roster tab. We will still have a fairly large field to work with for the message of the day. But should the player(s) miss the MotD, they will have that message broadcast to their chat each time they log in and represent, and when someone edits it. I hope this is an encouragement and thank you for bringing the subject up. And thank you all for your feedback for the Guild Halls content and for joining us on the stream today! Aww That’s it? 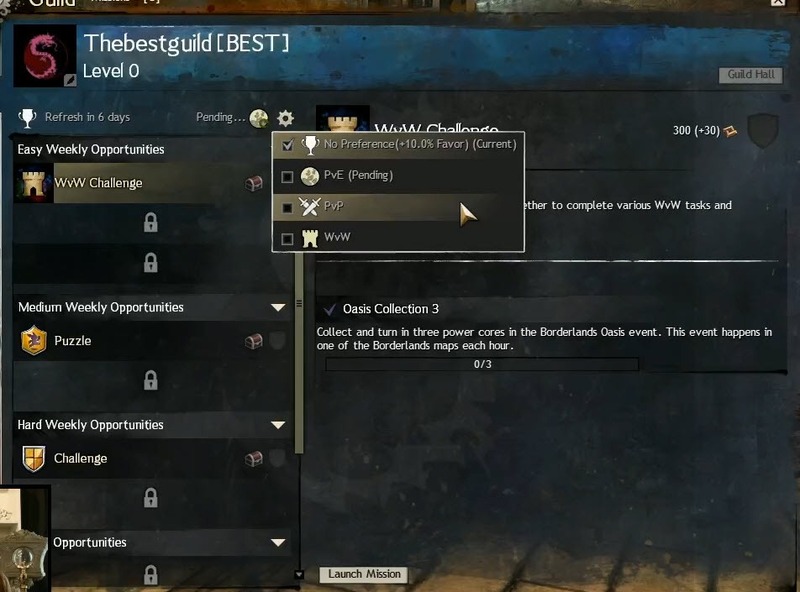 No more info on WvW missions? They told us there are 5 types and explained what they are. Are there any new PvE guild missions planned? I’m looking forward to something new and not just running the same missions we’ve had for almost 3 years. 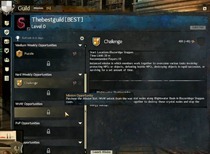 The PvP and WvW ones look OK I guess but they seem more like dailies that need to be completed in a guild group than unique Guild Missions (apart from WvW Challenge, I suppose). What about the clipping issues with shields and armor? will you do something to fix that?